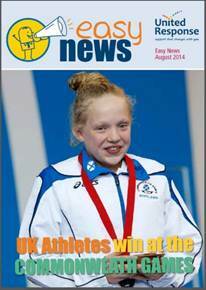 Learning disability charity United Response has published the 10th edition of its easy read news publication 'Easy News'. In the interview, Turney says: "I feel incredibly fortunate to have been able to seize the opportunities I have been given. It is important to stay positive and not to be afraid to ask for help and support along the way." The current edition of Easy News also covers world current affairs with articles on the Scottish Independence Referendum, fighting in Iraq, MH17 plane crash and the Rolf Harris court case. As the general election approaches Easy News readers can also find out about how changes to voter registration affect them. A free bi-monthly magazine, Easy News, makes news more accessible and easier to understand for people with learning disabilities. Since its launch in early 2013, Easy News magazine has continued to grow with 90% of readers saying it was easier to understand than other news sources while 78% felt that politics was now relevant to their lives, compared to 31% a year before (click here to read more on this story).